Mountain Chalet home for rent in Indian Mountain Lakes gated community. 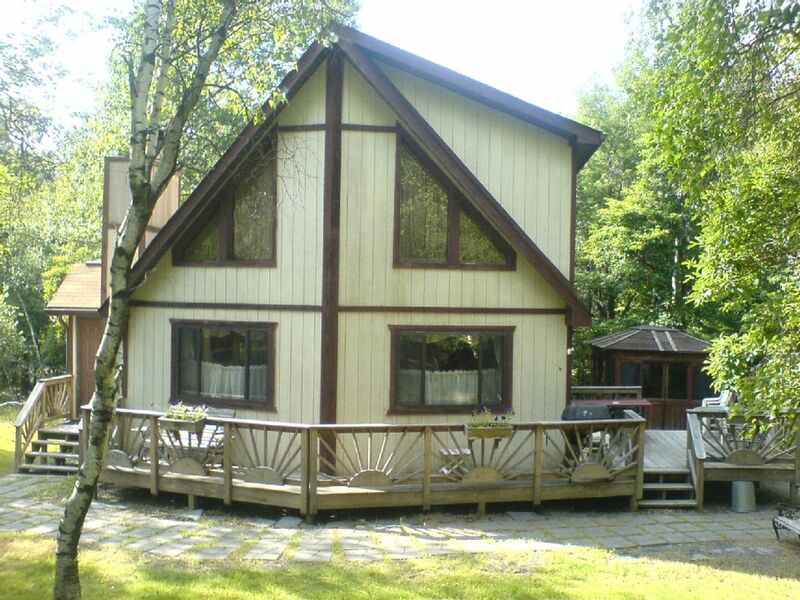 This home boasts 4 bedrooms, 2 full bathrooms, and sleeps 10. It's just 10 minutes away from Jack Frost/Big Boulder, Split Rock, 10 minutes away from Nascar racing, 30 minutes away from Camelback/Camel beach, 30 minutes away from 'The Crossings' premium outlet with over 100 stores located in historical Tannersville. It is now 40 minutes away to the brand new Mount Airy Casino in Mt. Pocono. This home also boasts a pool table, ping pong, dart board, game table, DVD/CD player, a crib, and even some toys for the tots! Outside grill and hot tub too! In the summer enjoy all the amenities of the gated community such as the two pools, 5 lakes, tennis courts, and basketball courts. Sleeps 10 with 4 queen sized beds in all the bedrooms and a queen foldout couch bed. Great house with lots to do! Our group had an amazing time playing pool and using the hot tub. There was no real need to go anywhere because there was so much to do in the house. Plenty of sleeping space, too. Definitely recommend! Thanks Joe, I am glad you had a great time. The chalet is a great space, plenty of room, etc.with lots of potential, but not well maintained. The hot tub broke down and was unusable, and the paths etc and driveway were a treacherous sheet of ice. (a large downed tree branch blocking the driveway was never removed, even after we contacted the owner.) No salt was on the premises to help with that problem- We asked for a small refund due to these issues, but have not heard back. To potential renters. There was a snow/ ice storm the day of the renters checking in. The hot tub was working when the renters checked in. I did not know what they did after they used it. They had some kids that used in correctly. I could not get a tree service in on the weekend during an ice/snow storm. It was the last renter for the winter. Things will be repaired and replaced The Renter burnt out the heating element on there first day. So it cost me to replace the part and I did not charge the renter. Ok is the best I can say about this place. A lot of littles things add up, remotes with no batteries or backs-oven not working properly-toaster oven in poor condition-couch being held up with a piece of firewood-one bed missing a mattress-table and chairs not steady-fireplace needs maintenance. I will be working on the house to get it up to date. It was a long winter. I ordered a new bed and they never delivered the mattress what a mess. Property was clean, kitchen was well equipped. Good location. Close to sking, good restaurants, great hot tub. Enjoyed the pool table. Beds and furniture need replacing. One box spring was replaced during our stay. The worst was the driveway. It was unplowed when we arrived with ice on top. After two days of rain and freezing temps the driveway was solid ice. It took us over an hour to get our vehicles up to the street. It was impossible to try to push, you couldn’t even stand up. We left a day early due to the driveway ice conditions. Parking on the street is not an option. It’s a great place for groups and would consider visiting again. Very enjoyable! Hot tub in closed outside and pool table upstairs kept us entertained. Also having the fireplace was very relaxing. Thank you Paul. It was a pleasure having you. The house was great and you really don't have any interaction with any of the neighbors, you're far enough apart and there are plenty of trees. The hot tub is in its own little enclosure which was nice because it was in the low 40s and raining the first night we were there.